Happy 114th Birthday, Bing Crosby! A true middle child, Crosby was the fourth of seven children. His father, a bookkeeper, was of English descent and his mother was a second-generation Irish-American. The family relocated to Spokane, Washington, when Crosby was three. When Crosby was seven, a neighbor, inspired by the Bingville Bugle, a popular humor feature in the Sunday edition of Spokane’s Spokesman-Review newspaper, nicknamed him “Bingo from Bingville.” The name stuck (though the -o was soon dropped). Crosby attended Gonzaga University for three years, playing on the school’s baseball team as a freshman. He never graduated, but in 1937, the university gave him the benefit of the doubt, awarding him an honorary degree. At 20, Crosby was asked to join a group of younger musicians in forming a combo called the Musicaladers (as to how that name was pronounced, your guess is as good as ours). One of the members of that group was Al Rinker, brother to Mildred Bailey, who would go on to great success as a jazz and swing vocalist. In 1925, Crosby and Rinker headed for Los Angeles, where Bailey’s show-biz contacts helped them find work. They were eventually hired by the star-making orchestra leader Paul Whiteman. During a stint in New York City, the pair’s prospects were bolstered by the addition of pianist and songwriter Harry Barris. They became known as the Rhythm Boys and their collective star was on the ascent. Extensive touring with the Whiteman organization allowed the Rhythm Boys to hone their skills and they became stars in their own right, with Bing being singled out for solo work on record and over the radio airwaves. They soon left the Whiteman group and signed on with Gus Arnheim, whose orchestra was featured nightly at the Cocoanut Grove night club at L.A.’s Ambassador Hotel. Bing Crosby was increasingly the focus of the act and he eventually made the logical move toward being a solo performer. Both his recordings and his radio program became huge successes. Crosby performed on 10 of the most popular 50 recordings of 1931. He began in films making shorts for Mack Sennett and his first feature-length picture, The Big Broadcast (1932), made him all the more successful. He would be a top recording, radio and motion picture star throughout the 1930s and ’40s and in the 1950s, he conquered television, too. From the 1940s to the 1960s, Crosby was a minority owner (15%) of the Pittsburgh Pirates baseball team. Crosby was the first choice to portray Lieutenant Columbo on the popular television series Columbo. After Crosby declined, he role eventually went to Peter Falk. Crosby notched 38 No. 1 singles over the course of his career, topping even Presley and the Beatles in the category. 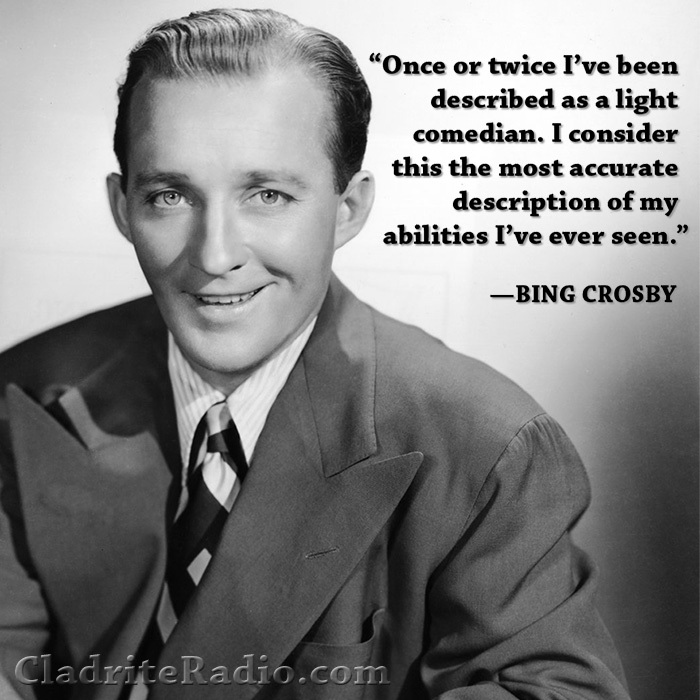 Happy birthday, Bing Crosby, wherever you may be! Happy 100th Birthday, Ella Fitzgerald! Happy 129th Birthday, Irving Berlin!